With all of the geopolitical uprisings as of late, not to mention the ever-growing explosion of debt along with global stock markets sliding, it's no wonder gold has been on the move and 2018 looks like the year it could really get going. Gold has also proved to be a hedge against inflation. It has been shown that over a long period, gold returns have outpaced the US Consumer Price Index. 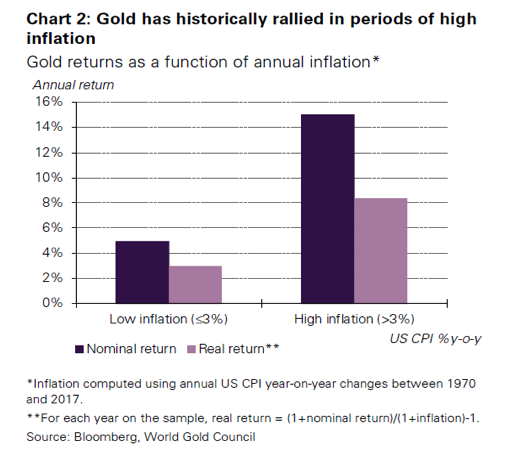 As is evident from the following chart, in years when inflation has been higher than 3%, on average gold prices have increased by over 14%. Gold demand has grown considerably during the recent past thanks to economic development witnessed in emerging markets, especially China and India and advent of exchange-traded products offering lower cost of ownership of gold. Investors’ attitude towards gold changed after the 2008-2009 financial crisis, as they started showing increasing interest in gold as risk management tool. 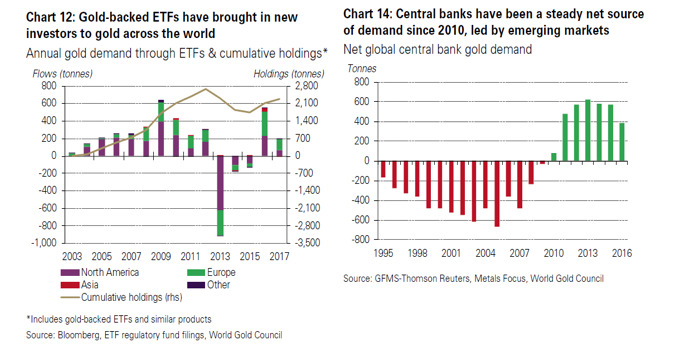 Various central banks, led by emerging markets too have expanded foreign reserves, resulting in increased net gold demand. Echoing positive sentiment, World Gold Council in its 2017 Annual Review forecast four themes would drive gold demand in 2018. The four factors identified by WGC are: strong growth in global economy, rising interest rates, frothy asset prices and market transparency such as the launching of LME precious by London Metal Exchange facilitating the efficient transaction in London wholesale market. During the post-crisis era, investors have been uttering “Tina” implying “There is no alternative” to investing in equities since bond yields have been offering limited yield or income. However, following gradual interest rate hike by the Fed, the three-month Treasury bill yield rose to 1.66 percent now, just trailing the current US equity dividend yield of 1.88 percent. Similarly, for the first time since late 2008, the 3-month Libor rate rose last month above the dividend yield. As the stock market turning more volatile and geopolitical tensions escalating each day, global investors would look at gold as an able ally to their preserve wealth. Hence 2018 could turn out to be the “perfect storm” for gold.